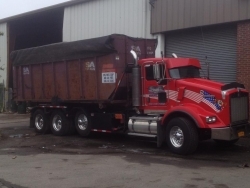 Long Island & NYC’s #1 dumpster rental service for construction cleanup projects of all sizes. Serving all of Long Island & NYC, including Bay Shore, Dix Hills, Farmingdale, Hampton Bays, Hicksville, Riverhead, Ronkonkoma, Smithtown, and all of Nassau & Suffolk County. Construction contractors in Suffolk County, Nassau County and NYC can call S&A Container Service for their dumpster rental needs. S&A Container Service has more than 180 dumpsters for rent on Long Island and in New York City, offering fast service at a low cost. Call us at 631-648-9088 today for a free estimate and availability. S&A Container Service’s construction dumpster rentals are available in 1/2 yard (mini containers for NYC building construction) 6 yard, 15 yard, 10 yard, 20 yard, 30 yard and 40 yard containers for construction projects of any size. Construction clean up dumpster rental services are vital to ensuring projects begin and end smoothly, on time, and on budget. S&A Container Service’s dumpsters for rent on Long Island and NYC accommodate all sorts of non-hazardous construction debris including concrete, dirt, construction and demolition debris, roofing shingles, landscaping debris and more. S&A Container Service strives to recycle as much construction debris that we can to be as eco-friendly as possible, and to get construction contractors the best dumpster rental pricing around. Click here to view an infographic of our dumpster sizes and dimensions, and click here to view recommended sizes for roofing debris. 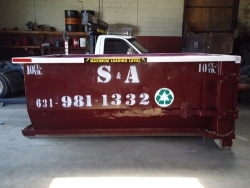 S&A Container Service is a licensed, bonded and insured dumpster rental company on Long Island. Our fast, dependable, and competitively priced roll off rentals are available in Long Island (Nassau County, Suffolk County), and all five boroughs of NYC (Queens, Brooklyn, the Bronx, Staten Island, Manhattan). Want to know how much your construction and demolition debris will weigh? On average, C&D waste weighs around 500 lbs. per cubic yard. The average C&D 20 yard dumpster will weight around 5 tons, depending on how the dumpster is loaded and how condensed the debris is inside the container.